Creating, configuring and managing SwiftStack nodes and clusters can be a fast and easy process if all the prerequisites are met. First-time users may generate an invite code to SwiftStack Controller As-a-Service by registering an account on the SwiftStack Customer Portal. 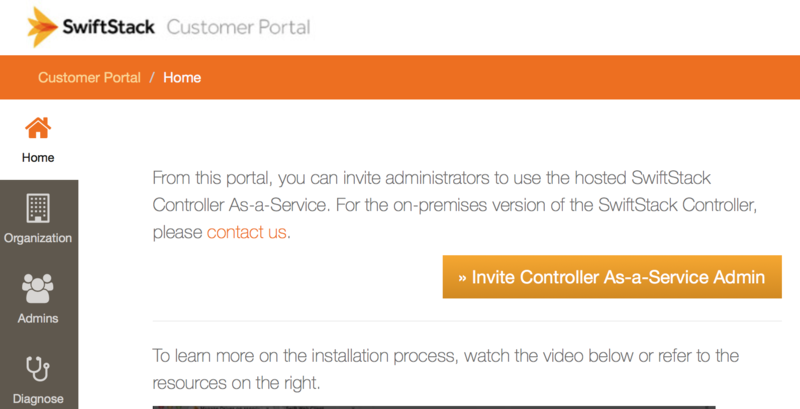 Once an account has been made on the SwiftStack Customer Portal, an invite code can be generating by clicking on Invite Controller As-a-Service Admin for an invite code and the link needed to create an admin account. For SwiftStack Controller On-Premises users, an initial account is created during the install process. SwiftStack is designed to run on standard server hardware. Further information can be found on our FAQ. What kind of hardware do I need? RHEL/CentOS 7.1 is no longer fully supported; existing 7.1 nodes should be upgraded to a later point release of RHEL/CentOS 7.x. RHEL/CentOS 6.6 or older are no longer fully supported; existing 6.6 or older nodes should be upgraded to a later point release of RHEL/CentOS 6.x. You cannot run SwiftStack on a desktop or 32-bit versions of any of the above supported operating systems. All commands on the server need to be performed with root privileges. Your sever will need to be set up with basic network configuration including static IP and correct hostname. Both port 443/TCP and 1194/UDP will need to allow outgoing traffic on your firewall. Some firewall policies prevent this, so it may be necessary to consult with your network administrator. Your SwiftStack nodes will need a route to a SwiftStack Controller. You will go to the SwiftStack Controller to configure, manage and monitor your cluster network firewall settings. The connection can't go through a HTTP proxy as the SwiftStack node requires a persistent connection with the SwiftStack Controller. If this is a brand new installation of CentOS/Redhat or Ubuntu then some packages may need to be installed (e.g. sudo on CentOS). Proceed to Creating Your SwiftStack Node.